I have wanted chickens for many years and finally decided it was time to take the plunge. My dear husband was a good sport - he muttered a little about this being another of my crazy ideas, but after almost 30 years of marriage nothing suprises him. 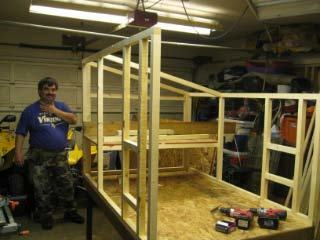 That said he did a fantastic job on building a custom coop for our little flock. I started out thinking I would get just four hens and found a local guy with Silver Laced Wyandotte Pullets two and a half months old. We went to take a look on a Monday at his healthy sassy flock and reserved six hens to pick up the following Sunday. With a deadline in place my DH got busy, he started on Tuesday and by the following Tuesday he was done - what a guy! We used a combination of new and repurposed materials, and combed the internet looking for ideas. He came up with a really practical and economical plan. He built just the frame in the garage so it would still be light enough to move. 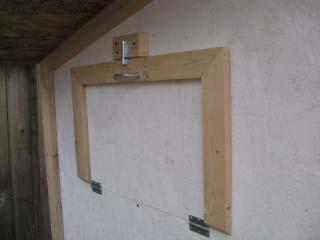 He then cut all the other pieces, assembled the door, added the window and built the nest boxes. He even added a plexiglass window for additional light, and came up with a great door that opens and closes by pulling a rope from outside the run. My job was to hold pieces as he cut and to paint everything inside and out with white enamel paint. It took four people to carry the frame out into the yard. 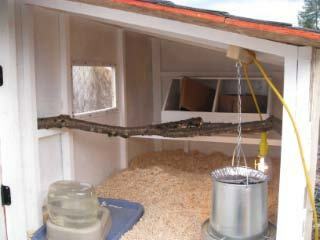 Once the coop was in place, he added the pre-cut walls, nest boxes and roof. Note the 6X18 dog run, bought second hand ten years ago the old heavy duty chainlink. He topped it off with used metal fencing for added protection. We also ran three foot high chicken wire completely around the bottom of the chainlink. He used zip ties (plastic cable ties to attach the wire to the chainlink) We elevated the coop to give them a covered area underneath and to help keep the coop dry. For extra security we fenced the space under the coop with hardware cloth. My plan is to install more of the used fencing to line the ground around the outside bottom of the pen, ziptie the top part to the wire, then use landscape pins to hold it down and let the grass grow through it. I hope this will help to deter any digging critters. He used branches from our plum tree for a double row of roosts. Note the entire end wall is a door that swings open for ease of access and cleaning. The nest boxes are blocked with cardboard till the girls get a little bigger. I don't want them to get in the habit of roosting there. Because we live in the rainy northwest, he planned for an overhang on all sides and he used leftover tar paper and shingles to roof the top. 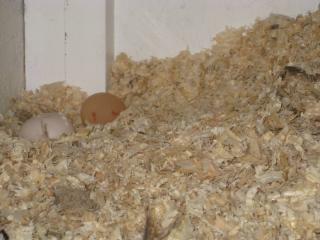 DH included a hatch behind the nesting boxes, which will make it easy to gather eggs and keep the nesting boxes clean. 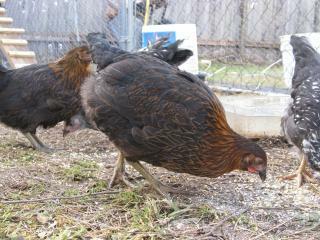 Did I mention the breeder threw in two free pullet "mutts"? 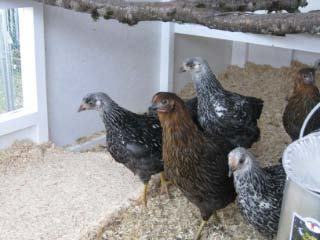 His Rhode Island Red Rooster got in with his Wyandottes so he had a few mixed pullets. So I happily brought home 8 hens - all the same age and raised together so what the heck. So far the weather has been dreadful, but the girls seem happy, are eating their fool heads off and after a few nights have mastered the roost. I've offered a small bowl of grit - playsand and crushed egg shells that they have been very interested in. The biggest "mutt" seems to be the bravest, I noticed they are already following her lead when I offer greens or cooked pasta. I can't believe how much they have grown in a week. Now I'll keep my fingers crossed and keep dreaming about fresh brown eggs for breakfast. Update on our little, bittie, biddies-well not so little any more. April 2009 about three months old. 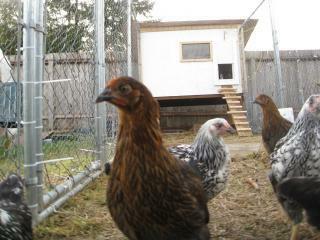 This is a Rhode Island Red & Silver Laced Wynadotte Cross, she is the bravest and seems to be the leader. I think the free "mutts" are just so pretty. 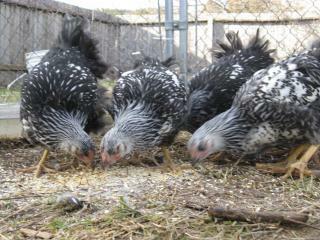 Our Silver Laced Wynadottes, notice that their combs are just starting to "pink" up. They are two weeks younger then the "mutts". The wind was blowing really hard so their tail feather are ruffled up. Nice chubby chickens, I love the fuzzy little butts they have! They are great composters and eat most of my kitchen scraps with great enthusiasm, their favorite is watermelon rinds but so far they have not turned anything down. Look closely at my girls on their roost. Yes, all eight squeeze onto the same roost even though there is another roost the same size, same height - right next to this one. This photo was taken on May 9, 2009 they are about four months old, note the bright red combs & "cheeks" a sign that they are close to maturity for egg laying. The SLW have a rose comb, theirs will never be as big and pronounced as the other two. 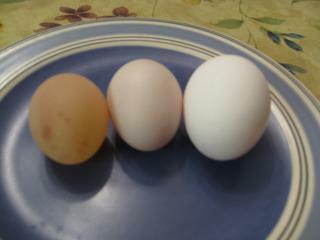 Because our hens were egg-catly four months old last week we were hoping they would soon start laying. On May 13, 2009 what a nice surprise, we were so egg-cited to find our first two eggs this morning. As you may be able to tell from the photos one was a soft shelled egg (kind of rubbery feeling) perfectly normal for young hens. 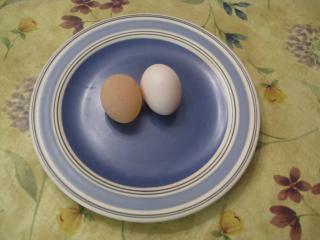 They were a little smaller then the store bought white egg. 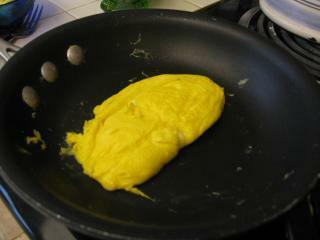 We scrambled them up and pronounced them as egg-cellent! This chicken hobby is so entertaining and tasty too. Can't wait to check for eggs tomorrow morning! I wanted to celebrate our first full year with chickens, I had no idea how much fun chickens could be! 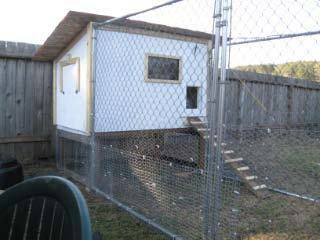 Our original coop design has worked very well, and chicken ranching has turned out to be a rewarding hobby. I spend a few minutes each day checking on my girls, topping off their water, scattering scratch, feeding kitchen scraps and of course gathering eggs. 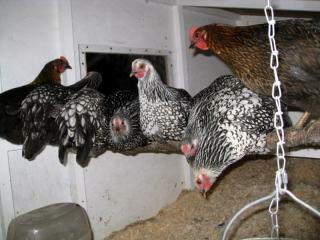 Here in the rainy Pacific Northwest, winter days are short and gray-hard on people and we discovered on poultry too. Yikes - just as our weather was really starting to get cold and rainy all their feathers started falling out in clumps, they were not eating much, were crabby towards each other and to be honest they just seemed lethargic. I was worried something was terribly wrong. Egg production fell sharply and there were even a day or two with none! Welcome to a full molt - typical but kinda freaky to be honest. 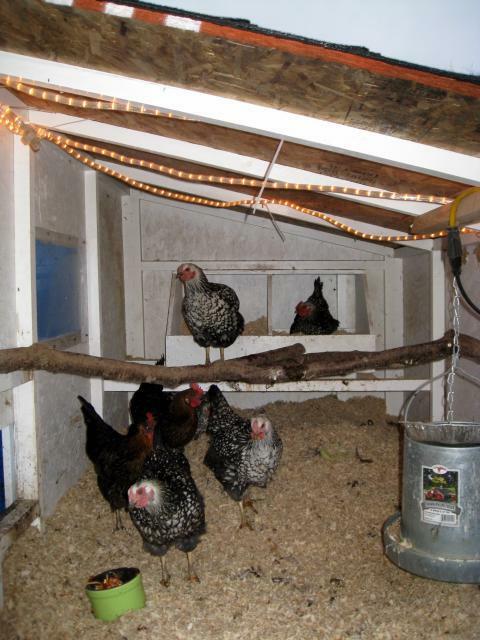 So after researching at BYC, we decided to add a few hours of light each morning using a timer and a string of rope lights tacked to the ceiling of their coop. 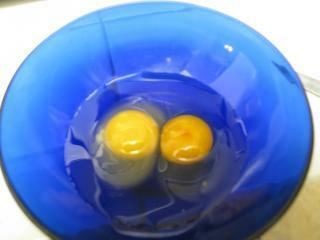 Their appetites returned with gusto, they seemed much cheerier and egg production went up to about two to three a day. Thankfully their feather grew in at an astonishing rate, naked chickens are not a pretty sight. 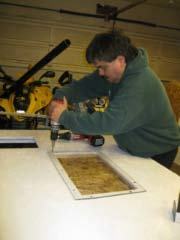 To deal with our legendary wet wet winters here on the coast in Washington we needed to caulk around our coop window and we added strips of insulation on the inside edges of the nestbox door. 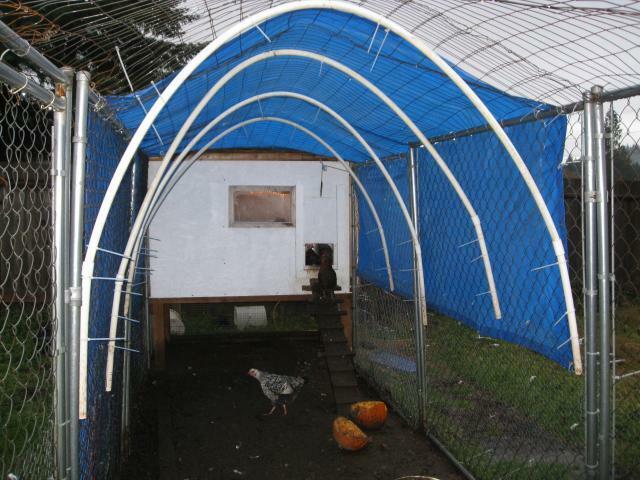 We used fexible PVC pipe to create arches against our wire fence "roofing". I held it in place with a rake while my DH ziptied it to hold it in place, then we spread a tarp, using more zip ties to secure it. I would estimate it took us less then an hour. Later on we added a couple inches of sand to the run, a scoop for $13 was about half a pick up truck load and was just enough. I am sure I will need to add more later on. They are really an easy care project, once a week I take about 1/2 an hour to add a few inches more of shavings to the coop, sprinkle it with a little more stall-dri and lightly rake it in, scrub out their water bucket and refill their hanging feeder. About once a month or so - it takes about an hour to completely rake out the coop and the nest boxes into a wheelbarrow (about three trips to the compost pile), then spread a fresh layer of shavings and stall dri. Really it is just that simple! Some of my girls are very friendly, most will let me pet them and several will let me pick them up. It makes me laugh everyday to watch those chubby girls race to the end of the run to see what goodies I have for them. During the winter for added protein I mix in whole black sunflower seeds to their layer pellets. Along with the kitchen and yard "scraps" it takes quite awhile to get through a bag of pellets and even longer to use up a bag of cracked corn. They really do eat just about anything, the best little composters on the planet! All in a few days hard work - mostly theirs and we appreciate each and every egg! 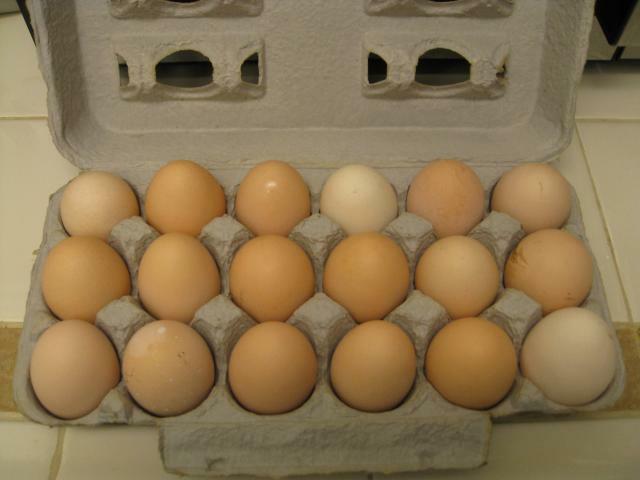 Notice the lovely array of color: cream through medium brown eggs, all large and a few so large they barely fit into the carton. We had a seven egg day recently - Spring is in the air! Looks like a decent coop. If it were mine I would add more ventilation. As always measurements would help others to build one.